There was rejoicing in the morning Sunday, and not just because it was a day of worship. I have to admit, some of the cause for the gigantic mental smile I wore was that my second Caramel Sweater was dry and when I slipped it on... the fit was perfect. Proof below in these pictures where I seem to ponder life's great questions. Questions like: Is my face too oily in this photo? Why couldn't my husband take one non blurry photo of me yesterday when it was a good hair day? Can I cut my head out of this and it not look strange? Is that sound I'm hearing my dog throwing up in the bedroom? Re-knitting this sweater a second time was a big mental challenge for me. Wonderful as the pattern is, I didn't really want to make two, but I gritted my teeth, stayed up late, stayed in front of the tv, and did it. These were my numbers for the set up row (front band, one front, arms, back, the other front, front band): 5-40-8-43-8-40-5. After increasing, my stitch count was 5-63-54-89-54-63-5. 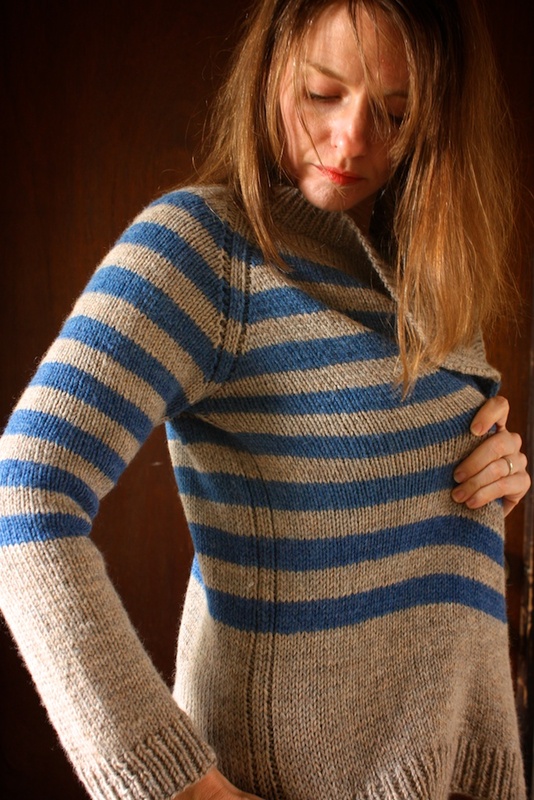 That fixed the trouble with the sweater widening. I still knit it a bit longer than called for in pattern, but not as much as I would have if I was working with another yarn because Patons Classic Wool (affordable and wonderful though it is) grows, people! The sentence above is an example of why punctuation is important. What a difference a comma makes. I followed the pattern the rest of the way except at the armpits. I picked up 2 stitches at the bottom, center of the sleeve hole (one on each side of where my round marker would go,) then I knit around to 1 stitch before the first stitch I picked up, ssk , placed marker, k2tog, and continued in pattern. Basically I just created two new stitches in the first round and decreased them at the end of the same round. I don't know why this helped so much but it seemed to "fill in" where there is often space under there. Of course, once I was finished, I went back and checked to see that all of those stitches were even, tightening and loosening as needed. 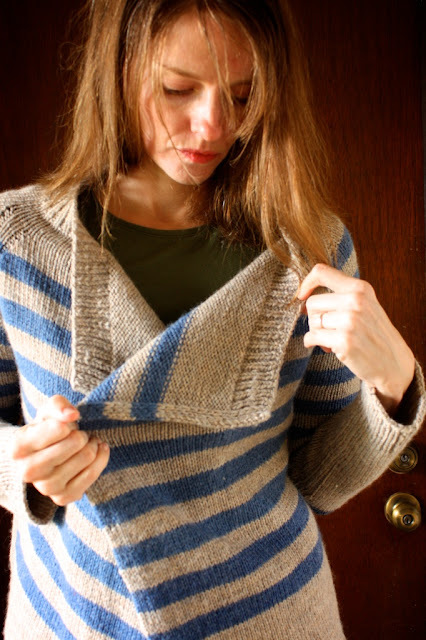 My advice, based on other knitter's notes: Break the yarn with each stripe and make the stripes an odd number of rows thick so they will begin and end on different sides, splitting the yarn ends that must be woven in between the two front bands. 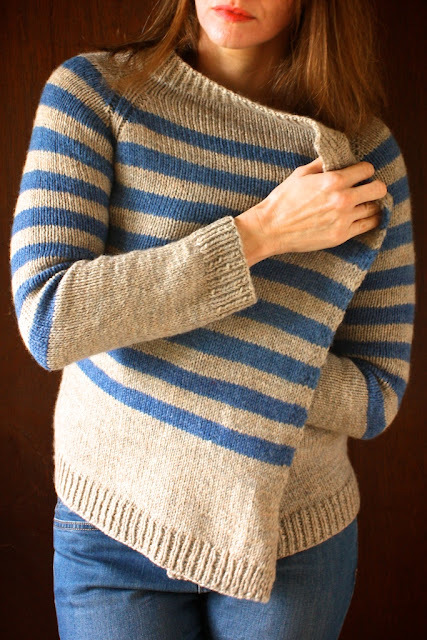 Then weave in those ends, but only into the front bands, which are already a little thicker and will hide them better than the body of the sweater. The option to either clasp it together or wear it loose and casual. The k1, p1 ribbing looks really nice. The way the stripes go just so far down the body and arms. It is uncomplicated, in pattern and appearance. The p1, k2, p1 "seam" running down the side and the length of the arms. That's my favorite part, I think. And that's my experience with Caramel. It may be one of my most favorite sweaters ever. 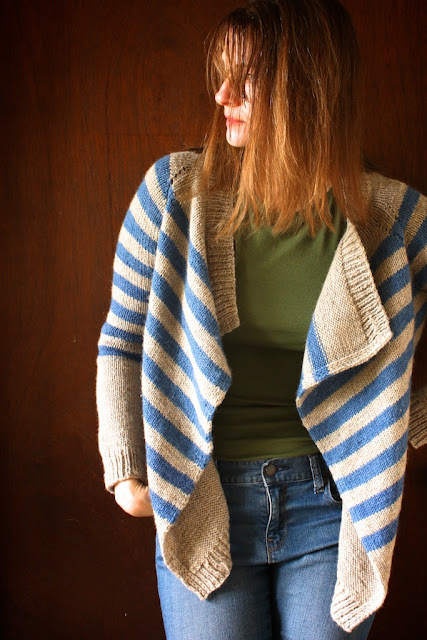 It's also uncomplicated enough to be a good project for a beginner and it's free on Isabell Kraemer's blog. Okay, so next up is Selbu Modern and my own version of a catalog - order cowl. Oh, it's so pretty. 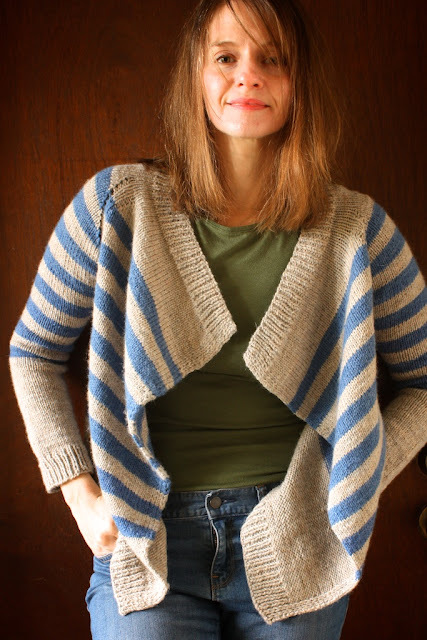 I'm thinking of knitting this sweater, but I never knit a sweater before and I'm kind of nervous - the idea of knitting something that has to fit! !